London South Bank University's (LSBU) men's rugby team travelled last week to Zhuhai in the south of China and took part in a cultural exchange program arranged by the British Council and the Federation of University Sport China, which is focused on boosting the profile of rugby in China. 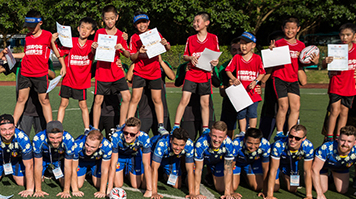 The UK-China Sports Week programme included a competition with local Chinese teams and Swansea University, who also represented the UK and edged out LSBU in the final game. The team has returned home with a silver medal as well as many memories, experiences and new friends thanks to the additional activities during the week. Phil Newman, Head of Sport and Recreation at LSBU’s Academy of Sport, said: “As well as the sporting competition itself, LSBU students took part in workshops discussing the UK-China sporting landscape, teaching and learning methods and also lifestyle similarities and differences of the student groups. “They also spent an afternoon working with local school children promoting rugby with fun activities and games and sharing the Rugby Football Union’s (RFU) values of Teamwork, Respect, Enjoyment, Discipline and Sportsmanship. It is hoped the trip will result in lasting partnerships and allow for further exchanges to continue offering students these invaluable experiences during their time at LSBU. The team included Rhys Amos, Andrew Broadbent, Louis Norman, Tom Gray, Alex Penfold, Paolo Nicosia, Max Gumpert, Ben Stothard, Benjamin Pearce, Louis Meffan, Jed Little, Ben Magowan, Alex Brewer and Sean Cooper. RFU coach Chris Spedding and Academy of Sport staff members Phil Newman and Niamh Digby Bratton also accompanied the team.